Metallic atoms hold some of their electrons relatively loosely, and as a result, they tend to lose electrons and form cations. In contrast, nonmetallic atoms attract electrons more strongly than metallic atoms, and so nonmetals tend to gain electrons and form anions. Thus, when a metallic element and a nonmetallic element combine, the nonmetallic atoms often pull one or more electrons far enough away from the metallic atoms to form ions. The positive cations and the negative anions then attract each other to form ionic bonds. The atoms of the noble gases found in nature are uncombined with other atoms. The fact that the noble gas atoms do not gain, lose, or share their electrons suggests there must be something especially stable about having 2 (helium, He), 10 (neon, Ne), 18 (argon, Ar), 36 (krypton, Kr), 54 (xenon, Xe), or 86 (radon, Rn) electrons. This stability is reflected in the fact that some metallic atoms form cations in order to get the same number of electrons as the nearest noble gas. See below. The metallic elements in groups other than 1, 2, or 3 also lose electrons to form cations, but they do so in less easily predicted ways. It will be useful to memorize some of the charges for these metals. Ask your instructor which ones you will be expected to know. 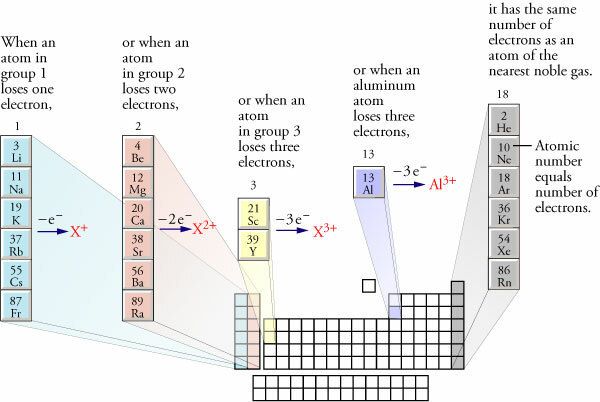 To answer the questions in this text, you will need to know that iron atoms form both Fe2+ and Fe3+, copper atoms form Cu+ and Cu2+, zinc atoms form Zn2+, cadmium atoms form Cd2+, and silver atoms form Ag+. The image below summarizes the charges of the ions that you should know at this stage. The names of monatomic cations always start with the name of the metal, sometimes followed by a Roman numeral to indicate the charge of the ion. For example, Cu+ is copper(I), and Cu2+ is copper(II). The Roman numeral in each name represents the charge on the ion and allows us to distinguish between more than one possible charge. Notice that there is no space between the end of the name of the metal and the parentheses with the Roman numeral. If the atoms of an element always have the same charge, the Roman numeral is unnecessary (and considered to be incorrect). For example, all cations formed from sodium atoms have a +1 charge, so Na+ is named sodium ion, without the Roman numeral for the charge. The following elements have only one possible charge, so it would be incorrect to put a Roman numeral after their name. The alkali metals in group 1 are always +1 when they form cations. The alkaline earth metals in group 2 are always +2 when they form cations. Aluminum and the elements in group 3 are always +3 when they form cations. Zinc and cadmium always form +2 cations. Although silver can form both +1 and +2 cations, the +2 is so rare that we usually name Ag+ as silver ion, not silver(I) ion. Ag2+ is named silver(II) ion. We will assume that all of the metallic elements other than those mentioned above can have more than one charge, so their cation names will include a Roman numeral. For example, Mn2+ is named manganese(II). We know to put the Roman numeral in the name because manganese is not on our list of metals with only one charge. There is only one common polyatomic ion. Its formula is NH4+, and its name is ammonium.